Most of us have Christmas trees and wreaths down pat by now—this year, capture the spirit of the season with unique holiday decor in less traditional places. From a Christmas vignette atop a tall armoire to jolly linens in a guest room, it’s a snap to spread holiday cheer throughout your space. 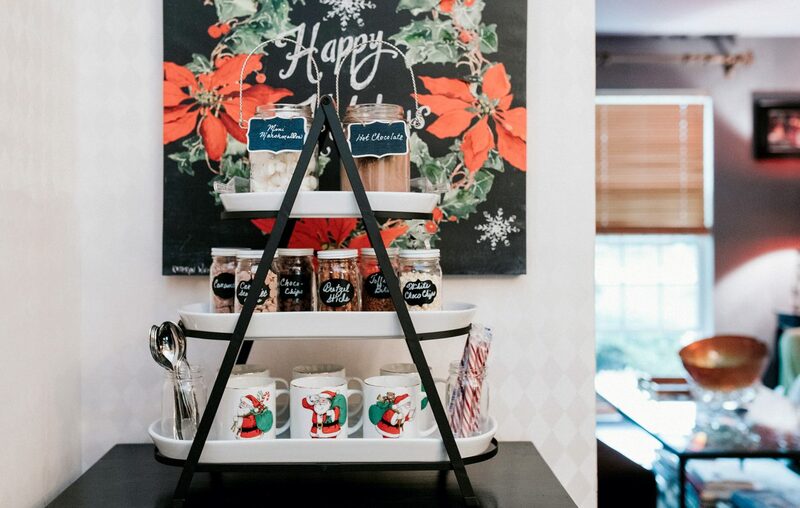 An easy way to cultivate a seasonable vibe is by putting items on hand into festive double duty as a hot chocolate bar. Choose a convenient spot like a kitchen counter, island or dining room buffet, and gather some tasty ingredients (check the bulk food section in the supermarket for peppermints, mini-marshmallows, caramels and the like). Stroll the major craft stores for display ideas, such as mini-jars with chalkboard labels, which will raise your cocoa station to the next level. Cake pedestals and tiered serving stands work beautifully, and the same basic concept works for a cookie bar, too. Turn up the glow and garner the reflective power of glass to amplify the holiday ambiance. Glass vessels—whether they’re terrariums, hurricane lanterns or cloches—are very much of the moment. Available at craft and home stores in many types and sizes, gleaming glass containers are ideal for showcasing seasonal ornaments, displaying a holiday scene or presenting natural accents. Throw in some faux-snow to cover a length of mini-LED lights and watch these beauties come to life. For an injection of Christmas cheer with minimal effort, consider transforming a bookcase shelf into a holiday vignette. Tip: Keep the display to a single shelf, or at most two if aiming for symmetry (such as with built-ins flanking a fireplace or a bed). Begin by lining the back of the shelf with holiday-themed gift wrap using double-sided tape. A simple pattern that repeats, such as snowflakes or stars, works best—then showcase some of your sentimental faves against the festive backdrop. Or elevate the top of an armoire or dresser by tucking holiday-themed ornamentation, like a glittery village church, in amongst regular decor like framed family photos, vases and glassware. (Check the major craft stores for these on-trend affordable cardboard re-creations). Round out the display with a trendy bottle-brush tree forest and a fresh faux snowfall. Strings of battery-operated mini LED lights that operate on a timer will create more magic come nighttime. Friends and family are sure to feel welcome when shown to a guest room replete with holiday cheer. Themed pillowcases stenciled with a jolly greeting paired with a winter-themed throw is an easy way to make festive bed. Adding a mini-tree atop a nightstand and a wall-mirror bedecked with a seasonal wreath will help set the tone for that long winter’s nap. In rooms that see lots of holiday action, consider framing and hanging objects with a seasonal motif. For instance, use a well-matted craft-store frame along with scrapbooking embellishments to show off a knitted dishcloth featuring a wintry scene. Or turn an embroidery hoop into a mini-wreath by embellishing with a sprig of evergreen and accenting with a tiny banner. Mini boxwood wreaths with a perky bow make a great accent for a cabinet handle. Of course, the most joyful way to decorate your home is the way that works for you and yours. If over-the-top is your style, by all means leave no surface without embellishment. If simplicity at a busy time works best, several judiciously-placed nods to the season will see your home glow with festive cheer.